Is craft time again! My last few post have all been food related and with Christmas just around the corner I thought it was time for some festive crafts. I love receiving homemade cards, so here are 3 cute and simple card ideas. 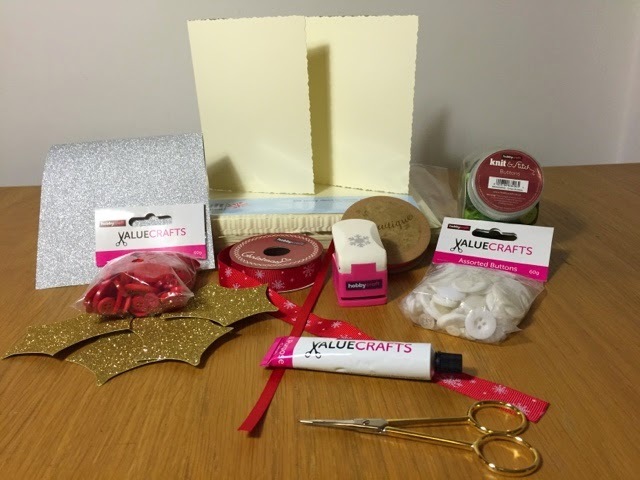 You will need a selection of crafting bits, most of mine were from Hobbycraft. To start, punch out three snowflakes from the silver card using the snowflake punch. If you don't have a punch then you can buy something like these snowflake stickers. Put a small dot of glue on the back of the snowflakes and place in the top left corner in a triangle shape, or you could add more across the top and down the sides to make it look like it's snowing. Now cut the ribbon to size, mine was roughly 6cm but you can see how it looks. To the back of the smaller button which will be the head, I stuck a small piece of black card to make it look like eyes. 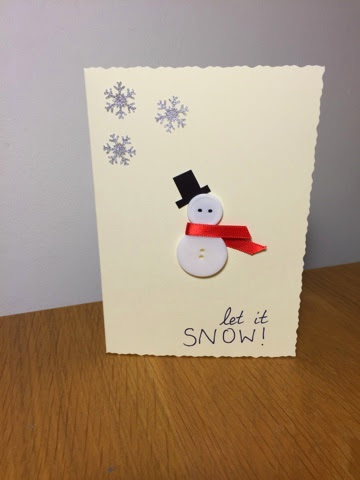 Now arrange the white buttons, ribbon and the hat to make your snowman. It's worth having a play around to see what looks best before glueing. When you are happy glue half of the red ribbon and then stick the body (larger button) on top of the ribbon. Stick the head (smaller button) above the body and tuck the black hat under. Then wrap the scarf over the buttons and stick it down well. 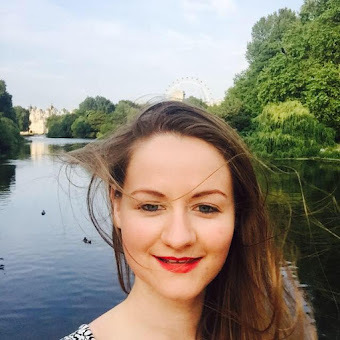 Next add your message, I liked "let it SNOW!". There it is a super cute and easy snowman. For the holy I used gold glittered gift tags, I glued them one on top of the other at different angles. Where the two leaves meet I glued one large red button and then two smaller buttons to the side to resemble a cluster of berries. 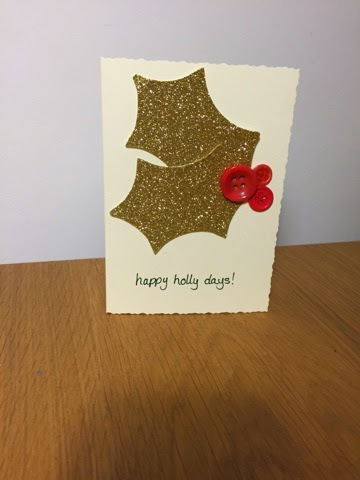 I finished the card off with the message, "happy holly days". This is a fun and very fitting message. 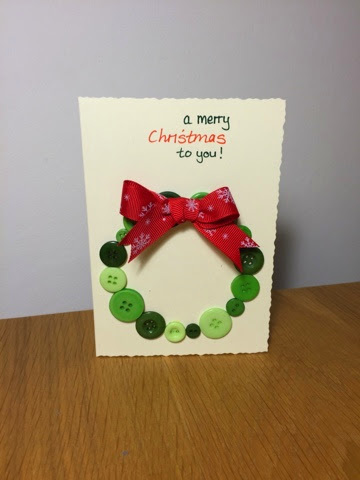 And finally the Wreath card. As the message is above the design I wrote this first, "a merry Christmas to you". Beneath the message I drew a faint line around a glass with a pencil to form a circle and used this as a guide when placing the buttons. Make sure to use a range of sizes, I used about 16 buttons but you may use more or less depending on the size of your circle and buttons. When you are happy glue them down. To finish off the wreath make a bow with the red ribbon and glue to the top of the wreath. I love these festive colours on this traditional wreath design. 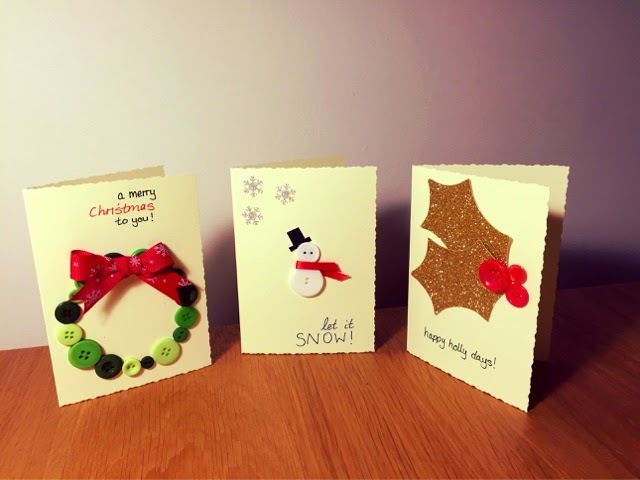 And there you have it 3 simple handmade Christmas cards! Let me know your favourite?